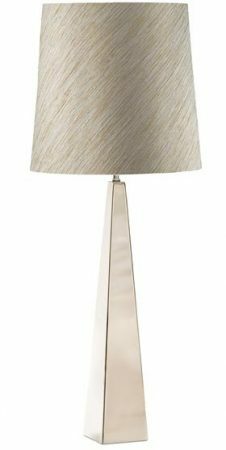 This Elstead Ascent contemporary polished nickel tapered table lamp with choice of shade is slender and stylish. Constructed from steel and plated in a highly polished nickel, with square base that tapers to a peak. Part of the Harlequin collection, made in Ireland and supplied with a 30cm tapered shade in a choice of fortune silver (as shown), duck egg or juniper slate, please see the secondary image and let us know your choice using the special instructions box at the checkout. Please note that the dimensions shown in the technical information below are for the base only. Height with the shade as shown 72.5cm, diameter 30cm. Shade diameter 30cm, height 30cm. There is a matching Ascent floor lamp in polished nickel with a choice of shade colour, please see below. This table lamp is exclusive to Elstead Lighting, a British company that specialise in the manufacture and distribution of decorative lighting such as the Ascent contemporary polished nickel tapered table lamp with choice of shade you see here.